Satellite systems used on aircraft, ships and by the military contain bugs that could let hackers take control of them, a security researcher has warned. 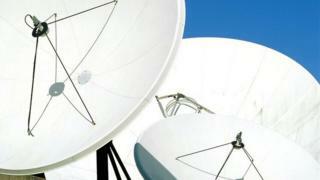 The worst bugs could let attackers overcharge satellite antenna to damage the equipment or harm operators. And others could be used to betray the exact location of military forces in crisis zones, the researcher said. IOActive, which found the bugs, said it was working with manufacturers to harden devices against attack. “The consequences of these vulnerabilities are shocking,” said Ruben Santamarta, from IOActive, in a statement explaining some of his findings. Details of the vulnerabilities will be presented later on Thursday at the Black Hat security conference in Las Vegas. The broadest group of devices vulnerable to attack were in use on commercial aircraft, Mr Santamarta told technology news site eWeek. Some of the vulnerabilities affecting aircraft required an attacker to be on that flight, he said, but he had also found “hundreds” of vulnerable devices that could be accessed remotely via the internet. None of the loopholes gave an attacker access to the avionics systems used to control flight, however. Other problems had been found with satellite ground stations on ships and in US military bases, Mr Santamarta said. On ship systems, attackers could potentially gain control over satellite receivers to aid eavesdropping or damage the antenna by pumping up its power output, he said. Mr Santamarta had won access to the satellite communication systems via backdoors in their controlling code, he said. The backdoors had not been inserted maliciously but had probably been added during software development. Although, in some cases the devices being used could not be updated with secure software. Instead, the entire device would have to be swapped for a more modern version running less hackable code. IOActive says it delayed publishing details of its findings while manufacturers act to negate the bugs. And the latest research builds on work done by Mr Santamarta in 2014 which first unearthed potential problems with the satellite communication systems and devices.